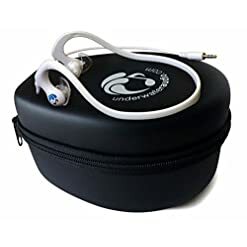 Includes waterproof earphones with excellent sound both above and below water – suitable for swimming, surfing, jogging, normal use, etc. 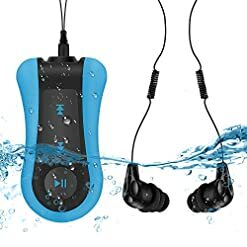 * Earphones – in-ear waterproof earphones for use while submerged in water. 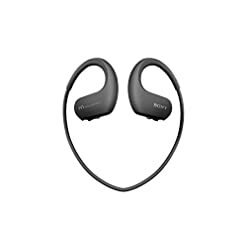 The earphones come with earloops and a partly twirled anti-tangle earphone cord long enough to allow fastening the MP3 player in waist height. * Earbuds – different sized exchangeable earbuds for the waterproof earphones to fit all ear sizes. * USB connector and charger cord in one. This cord is used when connecting the MP3 player to a computer to transfer audio files onto the MP3 player. While connected to a computer the MP3 player functions as a normal high speed USB drive compatible with the usual means of copying MP3 files like drag and drop – also works by dragging songs directly from iTunes into the MP3 player window if the songs are in MP3 format (conversion from other formats to MP3 is very simple in iTunes, see Apple’s support article ht1550 for details). * Plays all audio files in the order they were copied onto the MP3 player, does not have support for playlists or random play mode. 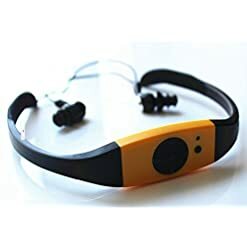 2) Secure the MP3 player to a pair of swimming goggles, shoulder strap, etc. Note that the MP3 player clip can be rotated. 3) Plug the waterproof earphones into the ears and enjoy a high quality listening experience both while above and while submerged in water. Compatible with Windows, Mac OS X, Linux 2.4 and newer. One year manufacturer replacement warranty on the MP3 player, earphones, USB cable and user manual.